In an eye-opening poll, Australian cruise fans have voted for our own Kimberley as their Best Cruise Region. This remarkable turnaround may be a result of the dreaded GFC or just a growing awareness of our own enviable natural assets, but the result has dethroned the mighty Mediterranean from its once unassailable top spot. Cruise Passenger Magazine, Australasia’s pre-eminent consumer print magazine for the cruise industry, surveyed readers as part of its annual Readers Awards. While the Mediterranean is still close to our hearts, the Kimberley is clearly gaining a very special place in our travelling psyche. “The Kimberley is such a beautiful area. We loved the cliffs, the changing scenery, the Aboriginal art, the waterfalls and the solitude. Every day there was something different to do.” Adrian Lutton, of Gordon, NSW, who cruised the Kimberley with his wife, Jill. In the categories of Best Small Ship and Best Adventure Cruise Ship, there was little surprise to find Sarina Bratton’s beloved Orion leading the charge. However in the category of Best Ship Cuisine, Orion’s Serge Dansereau’s menu came up trumps, toppling the fancier international runners. 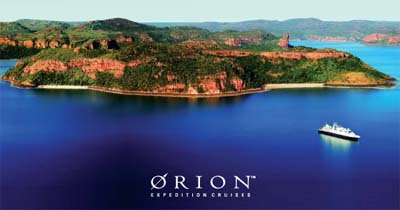 “Orion offers fabulous destinations accompanied by expert guides who ensure each experience is an adventure. We found Orion to be really well organised and it definitely visited remote places,” said Robyn Jacobs of Killarney Heights, NSW, who cruised to Vanuatu, the Solomon Islands and Papua New Guinea with her husband, Greg, in April 2009. Looking for more surprises, it was refreshing to see tiny Kimberley specialist, True North, snapping at Orion’s heels in all three categories. When you consider True North carries only one third as many passengers as Orion, client satisfaction is clearly overwhelming. Having travelled on both vessels, it’s easy to see how either can develop strong loyalties with past travellers. I’d say the message to frequent cruisers of each is to check the other vessel out. Third place in Best Adventure Cruise Ship was another favourite of mine, Oceanic Discoverer, operated by Cairns-based adventure pioneers, Coral Princess Cruises. Carrying 72 passengers to the Kimberley, NZ, PNG and Melanesia, Oceanic Discoverer should be on your list too. Clearly the Kimberley is racing up the charts in our favourites. With media attention from the movie ‘Australia’ and the worrying oil and gas projects planned along the coast, the Kimberley has enjoyed a press deluge these last twelve months. But let’s not sit by idly congratulating ourselves, the Kimberley needs our help. "We are watching politics dictate the terms and conditions of our homelands… places where we've always had a sense of connection and belonging. We are now being told that this homeland, this country is now going to be used for industrial development," said Aboriginal spokesperson for the Save The Kimberley organisation, Albert Wiggan. Visit the Kimberley, soak up the ancient landscapes and all that it delivers, but remember, we are the custodians of this special place. We decide what happens there and if it is still around for future generations.